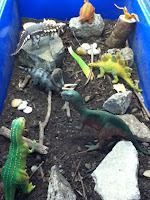 Dinosaurs are all the rage in my class at the moment as many of my kids went to Walking with Dinosaurs last weekend. So we got out the dinosaurs and turned our water trough into Dinosaur Land! The kids decided we would need dirt and rocks and plants (although they didn't last very long - getting trampled almost instantly). After J bought in a movie of dinosaur photographs he had made with his mum one of my boys suggested that we should make our own Walking with Dinosaurs movie! I was thrilled and quickly got out my Flip camera. He was absolutely wrapped with the result and it was super easy too! 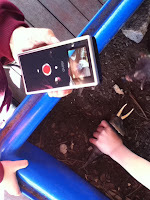 With a little help from me to write the words (I needed to get out the dinosaur dictionary to spell some of the dinosaur names that I'd never heard of before) he dragged and dropped his footage into the imovie template. We were done in about 10 minutes!